Can there be a second Poker Boom? Phil Hellmuth is fond of saying that when the US government legalizes online poker there will be a second, even larger, poker boom. In Hellmuth’s version of reality, the WSOP will see the Main Event attendance balloon to unprecedented levels as new players pour into the poker economy. While this surely sounds well and good, the facts just simply don’t add-up for this type of explosion. I think the misconception comes from the poker boom hitting its roadblocks at its peak in 2006; Hellmuth and others apparently think poker was simply going to continue to grow at the outrageous pace it had been over the previous few years, when in fact this was the peak (or close to it). I remember back in 2006 you couldn’t talk to someone anywhere in the country that wasn’t playing in a home game, or participating in poker tournaments at local bars. The poker boom was already approaching its summit; maybe another thousand WSOP entrants could have been squeezed out of the poker economy… Maybe??? In Europe the poker fuse was already lit as well, the players from Europe are simply better now, which is why it seems like the Europe boom is a newer thing –having travelled to Germany extensively from 2003-2006 I can tell you that in 2003 there was a single POT LIMIT Seven-Card-Stud game in Spielbank Casino in Berlin in 2003, and by 2006 No Limit games were everywhere. In 2003 it was a struggle to find four players in a city of millions for a micro-stakes home game, where in 2006 you had to turn people away with €100 notes in their pockets. In 2006, the poker boom was in full swing, we were already squeezing every last potential player out of the economy. So why can’t the US poker economy peak again? And wouldn’t adding the new European players to the mix exceed 2006 numbers? In a perfect world the answer to these two questions would be an emphatic YES. Unfortunately, we don’t live in a perfect world, and irreparable damage has been done to poker by both the industry and the players. First of all, the repeated body-blows the online poker industry has received may not have knocked them out, but they have definitely taken their toll. Between UIGEA, Super-User’s, the immoral behavior of some of the game’s biggest stars (ghosting, Multi-accounting, and so on), Black Friday, and Full Tilt Poker and UB/Absolute Poker, the confidence in the online poker world is probably hovering somewhere around Congress’. Even with poker legislation, too many people already have a bad taste in their mouth about online poker. Thinking back to the early 2000’s I remember most of the “live” poker pros swearing off online poker as some rigged version of the game, now there is actual proof that online poker is corrupt! The damage to the online poker brand has been done already, and government regulation isn’t quite an edict from above that everything will be ok with the industry from here on out. After one of the industry’s most trusted brands betrayed us (Full Tilt Poker), despite being regulated in multiple European countries, are we to believe that the US government will be able to offer the safeguards needed to be sure we are not conned, scammed, and cheated, by online poker sites??? A lot of people simply won’t take this risk. I think the real reason we will never see a second, larger, poker boom is that the old maxim that, “Every player has a chance” no longer applies. The genie is completely out of the bottle in terms of what it takes to win at poker. In 2006 if ½ your table in $100 No Limit game understood pot odds you would look for a better game. Nowadays, ½ your table at a $100 No Limit game is likely thinking at a fairly high-level, using PokerTracker, have a subscription to an online training site, and multi-tabling eight games at a time. For this I blame the players. In the pre-boom days the best players handed out information, but these strategies books were fairly basic, and just sound enough to make a player completely exploitable. Once the boom started, and players realized the tremendous amount of money that could be earned a tidal wave of books and other strategic aids were readily available; each wave increasingly more in-depth than the previous. Players who could never think for themselves or draw the conclusions from the old books (left wondering why they still couldn’t beat the game even though they read Holdem Poker for Advanced Players three times) were suddenly given a chance to enter a Poker Doctorate program at Harvard on the cheap. I don’t really blame the players that managed to cash-in during this time because someone was going to do it. In the same breath, they had to understand that by divulging this information (which even in the early 2000’s was rarely talked about in public) they were forever changing the game of poker. Now poker is looked upon like Chess; a skill game dominated by an elite group of players. People will still play, but the new players are simply not going to flock to the game like they did in 2005 and 2006. Those home games I talked about above are drying-up because people now “get” why a few of their friends win a lot! The economy (around the world but definitely in the US) is not the same as it was in 2006. Disposable incomes are drying-up and the segment of the population most likely, and with the means, to deposit a couple thousand dollars at an online poker site is shrinking. The economy could turn around, but for the foreseeable future the overall potential player base is simply far smaller than it was in 2006. When the US government does legalize online poker my guess is that there will be a large influx of players into the poker economy, but they will mainly be Micro-Stakes players. You won’t have people jumping into $5/$10 NL games upon signing-up; instead the money will flow up to these stakes at a far slower rate. The winning players at each level will bring this “new” infusion of money up the poker ladder as they take their shots at higher-stakes games, but this will be a slow and tedious process, and nothing like the Wild West days of the 2003-2006 poker world. The next poker boom will likely see us hit 2006 numbers; not the 10,000-20,000 players at the WSOP Main Event Phil Hellmuth believes are out there. 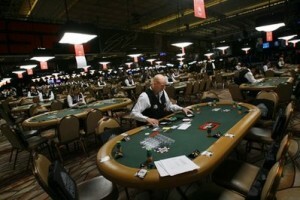 This entry was posted on Monday, January 16th, 2012 at 6:31 pm and is filed under Poker News. You can follow any responses to this entry through the RSS 2.0 feed. You can leave a response, or trackback from your own site.